It was a quite simply amazing afternoon and evening at Donkey Lane yesterday as Enfield Town beat Leatherhead 3-1 thanks to goals from Corey Whitely, Ryan Doyle and Bobby Devyne. 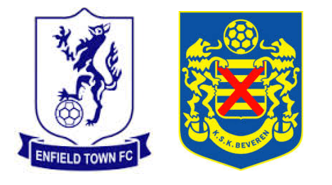 The atmosphere was superb (the best I have ever seen at an Enfield Town match) thanks to the Enfield Town Ultras and the brilliant sixty or so YB SK Beveren fans who made the long trip from Belgium to watch the match. The two clubs found friendship as they are the first fan's formed clubs in England and Belgium. They first came to North London in 2013 for a friendly with Town travelling over to Europe last summer for a match and weekend tour - Long may this continue - The Beveren fan are superb!!! - it was great to see them all enjoying themselves yesterday.